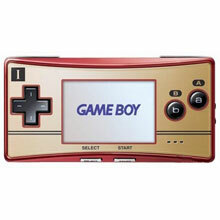 Not that I want one of these as I am not a Game Boy fan but it's just that I saw the new Game Boy Micro in Fry's the other day and I was instantly impressed how the have scaled this thing much further. It's basically the same as Game Boy Advance but in a new packaging. And the 20th Anniversay Edition brought a smile to my face. It's removable faceplate is designed to resemble the old Game & Watch. Does anyone still remember Game&Watch? Donkey Kong? Donkey Kong Juniour? Octopus? What else? There's one where people jumped out of a building on fire and you played the firemen below using a trampoline to bring them to safety. You mean I can play Octopus, Firemen if I buy this?